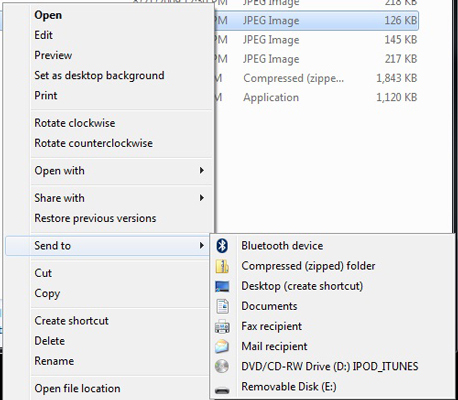 If you’ve done any copying or moving files, you’ve no doubt discovered the Send To menu when you right-click a file. 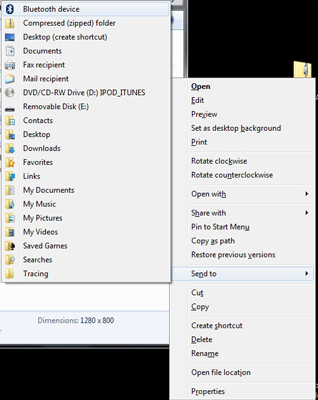 For Windows 7, Microsoft has included a number of hidden shortcuts that you can access when you expand the Send To menu. To access the Send To menu, right click on a file or shortcut. You’ll see the default Send To options. Click any blank area away from the file in question, then go back and right-click again while holding down the Shift key. You’ll see all sorts of extra options! If you don’t want to have to hold down the Shift key, you can add any of these shortcuts (or any other shortcut for that matter) to the default Send To menu by adding the shortcut to the SendTo folder in Windows Explorer. Just type shell:sendto into the location bar on any Windows Explorer window to open the SendTo folder. Click and drag any shortcut to this folder and the item will appear on the default Send To shortcut menu.